The raucous troupe of monkeys that visit Dr. Jinie Dela’s house in Panadura do not realize how closely they are being studied. Dr.Dela, a biologist, with a doctoral degree in primate ecology and behaviour, treats her sprawling one-acre garden like an enormous, open laboratory. The primates who come visiting, sometimes on a daily basis, have always found a feast waiting. Ripe jakfruit, mango and kapok and fistfuls of tart, dark tamarind keep them in the trees surrounding the house. While the primates feed, Dr. Dela makes note of how they interact and what they like to eat. But these lovely, energetic monkeys are one of 25 critically endangered primate species on The International Union for Conservation of Nature’s (IUCN) Red List. The species is believed to have undergone a decline of more than 80% over just three generations due to a combination of habitat loss and hunting. If nothing changes, the IUCN predicts that this decline will continue. For decades now, these animals have been increasingly reliant not just on forests but on large home gardens, like Dr.Dela’s. Now she, along with her colleague Dr. U.K.G.K. Padmalal of the Open University and with experts from Sri Lanka’s Forest Department, are working on a new model for management of small forest systems that will meet a quartet of goals: protecting a critically endangered monkey; enhancing forest ecosystem functions; providing an uninterrupted supply of water for local people and finally, reducing monkey-human conflict. “It’s basically a new way of managing these small forest systems that have been overlooked for nearly half a century,” Dr. Dela tells the Sunday Times. 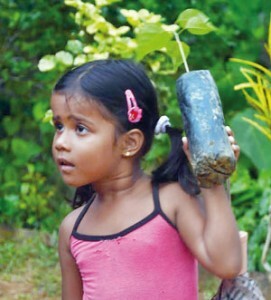 The forests they are working in, such as the small but lovely Indikada-Mukalana or Waga in Colombo District, have been growing increasingly fragmented since the colonial era. Many forests across the island were subject to heavy logging in the 1970s. Subsequently, some patches were turned into plantations, and others have regenerated into secondary forest, explains Dr.Dela. “However, due to all this clearing and regeneration, invasive species such as alstonia and ochlandras tridula have crept in. This is hampering the regeneration of some areas of the forest as well as hampering the plantation trees from growing,” she says. For these small forest patches to survive intact, they need buffer zones around them, and corridors of trees that link to other similar clusters. “This can only be done if we can get people to have some canopy cover in adjacent home gardens,” says Dr. Dela. She believes that for this approach to be sustainable, it also needs to offer tangible benefits for local people. “Getting rid of the orchlandra and converting the plantations into multi-purpose, multi-species plantations will have multiple benefits,” she says. The Forest Department will celebrate 130 years of existence in 2017 said Mr. Sathurusinghe, pointing out that in the fight against the ongoing degradation of the environment, the department must now consider new approaches. “One way is to work with the community. The sustainability of the project depends on how you improve their livelihood,” he said. They have been conducting socio-economic surveys and community consultations in villages around the forest. They will use this information to create innovative community based livelihood development schemes through Community Based Organisations (CBOs) monitored by the Forest Department and the project team. 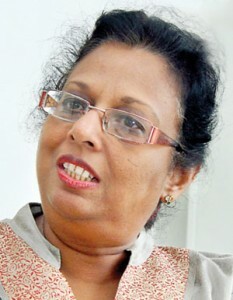 Mr. Sathu-rusinghe’s hope is that eco-tourism will receive a boost in these areas. This holistic approach is new to Sri Lanka, but if it works, the Forest Department will adapt it for use in other parts of the island. The foundation for this project was laid between 2007 and 2010, when Dr. Dela and Dr. Padmalal collaborated with the Forest Department to carry out a comprehensive >7000 km survey of the historic range of the Western purple-faced langur in six administrative districts. The team visited over 70 forests and traversed 46, helping along the way to re-define the geographic range and identify potential forest refuges for this langur. They were able to pinpoint major threats and hot spots of serious monkey-human conflict. However, they were also troubled by what they saw – home gardens were becoming increasingly fragmented and connections between small forests had been disrupted. “I think it was by 2005 that I started noticing that the home gardens were going. Former study sites were unrecognizable now, there were no trees,” says Dr. Dela. It was also clear that the monkeys were struggling. Under Phase II, the team is now looking at a pioneering study of the behaviour and social organisation of forest living Western purple-faced langur in the Waga, in an attempt to understand their habitat and food preferences. Their organisation Probe for Nature is being supported with funds from the National Science Foundation (NSF) of Sri Lanka and Primate Conservation Incorporated (PCI) USA for this phase. The data collected could help them “enrich” forests with the kinds of plants the monkeys love to eat. Doing so could mean the monkeys would no longer have to go into villages to feed says Dr. Dela, thereby reducing monkey-human conflict. Currently, the team is also collecting specimens for the herbarium in the Seethawaka National Botanic Gardens. “There are some red listed plant species in the area that are in need of conservation,” says Dr.Achala Attanayake, Deputy Director, Department of National Botanical Gardens. She says the samples shared by the team with the Botanical Gardens have been stored both in the wet zone botanic collections as well as the international collection at Peradeniya. Many of these are extremely rare, and hard to locate, so having the team on the lookout for them has proved invaluable. In return, Dr. Attanayake and her team are also advising the conservationists and providing planting materials for the project. It is clear that for Dr. Dela, the project’s ambitious, complex vision may be challenging but is nevertheless desperately needed, because it recognizes that conservation cannot happen in isolation. It is not only the fate of the Western purple-faced langur that hangs in the balance, but the survival of the forest. So too, the people that depend upon the trees and the animals, even if they do not yet realise it. Man, monkey and forest need each other, and it is Dr. Dela’s mission to remind us of just how much. Published in Sunday Times on 18 December 2016. By Smriti Daniel. Images courtesy Dr. Jinie Dela.